Mercury has the most eccentric orbit of all the planets. At closest approach (perihelion) it has an orbital radius of only 46 million kilometres, but its furthest distance (aphelion) has a radius of 70 million kilometres. At perihelion Mercury travels around the Sun at a very slow rate. Figure 4.3 Shape of Mercury's orbit (distance circles are in astronomical units, AU). Observation of Mercury is difficult because of its close proximity to the Sun. The best time to view the planet is when it appears above the horizon twice a year at its greatest distance from the Sun. At these times, Mercury can be seen just before sunrise or just after sunset. 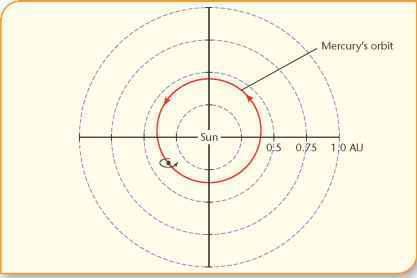 The axis of rotation of Mercury is almost vertical. 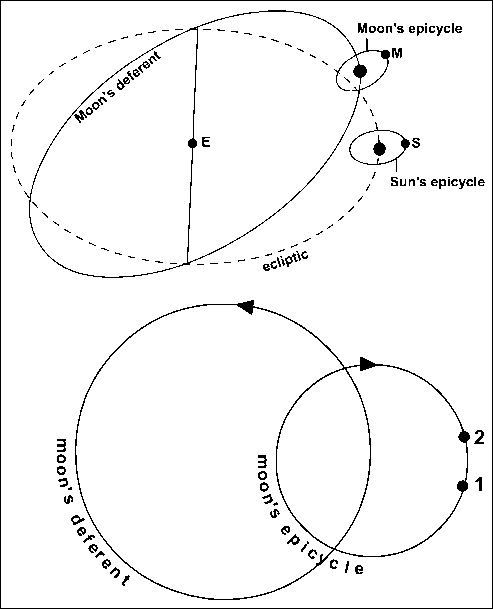 This means the plane of its equator coincides with the plane of its orbit. Mercury has the shortest year of any planet, taking only 88 days to orbit the Sun. It has no known satellites (moons). Because it is closer to the Sun than Earth is, Mercury is seen to go through phases just like our Moon. Mercury's size appears to vary according to its phases because of its changing distance from Earth. When Mercury first appears in the evening sky, it is coming around the far side of its orbit toward us, and through a telescope it appears as a thin crescent. At rare intervals, observers from Earth can see Mercury pass in front of the Sun. Such a passing is called a transit. Transits occurred on 7 May 2003 and 8 November 2006. A transit should be viewed by projecting the Sun's image from a telescope onto a white screen. The planet would appear as a black dot slowly moving across the Sun's image. Care should always be taken when viewing the Sun - never look directly at the Sun through a telescope.